Pluto is proving to be rather more remarkable than anyone ever expected. We’ve seen that it has an unusually young and smooth surface, a layered atmosphere, moving mountains, and a giant moon rent by an immense chasm. Now, research presented this week at the 2016 Lunar and Planetary Sciences Conference being held at The Woodlands, Texas, is showing just how dynamic this demoted little planet really is. Among the most exciting findings is the fact that Pluto experiences seasons and dramatic changes in atmospheric density, and that liquid nitrogen may once have flowed (and may still yet) on its surface. Even at a distance from the Sun of 5.9 billion kilometers (3.67 billion miles), Pluto experiences seasonal fluctuations. It’s tilted, like the Earth, but instead of a 23° angle, Pluto is tilted at 120° degrees in its orbital plane. That means that not only does Pluto have “tropics” and “arctic” regions—that is, regions of prolonged sunlight or lack thereof—but that nearly the entire surface may fall into both categories at different times of the Plutonian year. There’s also a dark band around Pluto’s equator that seems to correspond to a tropical area that never experiences arctic winter or summer—likely caused by a dearth of accumulated ice and other volatiles. The research also demonstrated that Pluto experiences Milankovitch Cycles, gradual shifts in axial tilt that are responsible on Earth for the Ice Ages. As on Earth, these shifts cause dramatic climatic fluctuations—though the Plutonian variety are somewhat more exaggerated that what our own, more fortunately situated planet experiences. For example, the changes in orientation and surface heating result in startling differences in atmospheric pressure—from as low as 10 microbars (1/100,000th Earth’s sea-level air pressure) to as much as 200 millibars, which far exceeds even Mars’ average of 6 millibars. 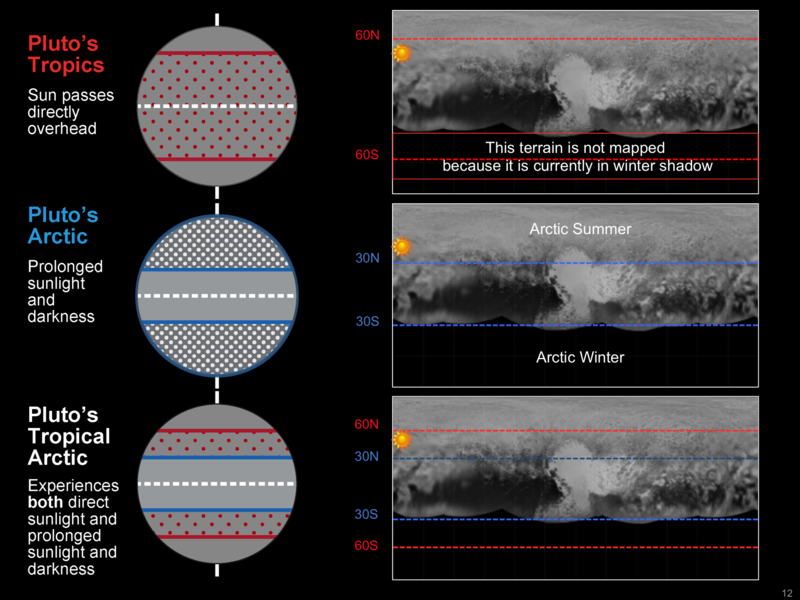 Such periodic high atmospheric pressure may explain certain unusual glacial forms apparent on Pluto’s surface. High pressure allows nitrogen (very abundant on Pluto) to exist as a liquid, and this may have flowed in the past—and may still in the future. In any case, Pluto is proving to be—very unexpectedly—one of the most active worlds in our solar system.